Masbruch says the city intends to begin another pilot project before the full stabilization project is projected to begin in 2003. 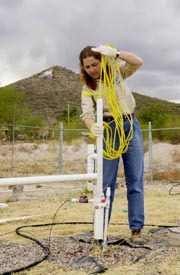 Environmental scientist Molly Collins bails water from a monitoring point near "A" Mountain. Forcing air and water into the heart of three landfills at the base of "A" Mountain will speed their decomposition from about 150 years to three years, a city experiment indicates. The technique will provide stable ground for projects at the west end of the Rio Nuevo Downtown revitalization project, said Karen Masbruch, the city's environmental management director. Natural decomposition isn't an option because it could yield explosive levels of methane gas under new buildings. Another alternative would be to dig up the landfills and carry off the 1.7 million cubic yards of trash, but that would cost more than $50 million. Rio Nuevo plans set aside $2.3 million for the landfill stabilization project. The three landfills, Nearmont, Congress and "A" Mountain, occupy 50 acres south of West Congress Street and west of the Santa Cruz River. They are up to 40 feet deep and contain garbage dating to the early 20th century. Their area will become home to the San Agustín de Tucson mission reconstruction, the Rancho Chuk Shon cultural center and large areas of open space, said Rio Nuevo project director John Jones. The city pilot project pumped air and water into a 50-by-50-foot parcel of the Nearmont landfill from July 24 to Dec. 20. Under normal conditions, a landfill will settle about 1 inch per year. With this technique, city officials recorded an average settlement of 10 inches in just 82 days. Naturally occurring microbes degrade garbage and reduce methane, and the project simply sped up the process, said Gary Walter, president of Hydro Geo Chem Inc., a local environmental consulting firm that performed the study. The rate of degradation reported by the city, about 100 times as fast as natural decomposition, would stabilize 99 percent of the garbage at Nearmont in just over two years. The city also monitored soil and ground-water samples and reported "no cause for environmental concern." Methane levels decreased significantly during the study, while oxygen and carbon dioxide increased. Walter said samples from around the landfill indicate few or no hazardous chemicals are buried there. 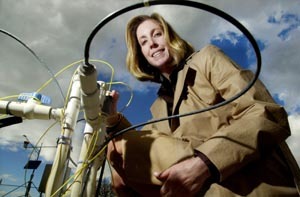 Even though water is being used in the landfill, the technique has sufficient controls to protect the aquifer from trickle-down pollution, said Arizona Department of Environmental Quality spokesman Patrick Gibbons. Masbruch said the city intends to begin another pilot project, covering three acres, before the full stabilization project is projected to begin in 2003. * Eric Swedlund is a science-writing intern with the NASA Space Grant program at the University ofArizona. Contact him at 807-8430 or swedlund@azstarnet.com. All content copyright © 1999, 2000, 2001, 2002 AzStarNet, Arizona Daily Star and its wire services and suppliers and may not be republished without permission. All rights reserved. Any copying, redistribution, or retransmission of any of the contents of this service without the expressed written consent of Arizona Daily Star or AzStarNet is prohibited. Content originally printed in the Arizona Daily Star.